I always hated the stock one. i am gonna do one for x64dbg also, when gets python support. I am feeling particularly stupid today and am puzzled about installing Sip. Can you explain using small words please? PyQt needs sip to run. ida need a special build of both PyQt4 and sip to run, the stock one wont work. So everything have to be rebuilded. the sip package is ready configured for ida, so do not reconfigure. just extract sip archive and use vs command line from extracted folder and do. You should check out the latest build. No push buttons but icon and hotkey based. Use hit hotkey Alt+E twize to load the editor. you can run files that depends on submodules. Want to say thanks to you! Is necessary any step more? Yes you have to install spesielt Build of PyQt. have Builded the latest Qt PyQt-win-gpl-4.11.4 framwork from scratch. Then made a installer that install it correct and add the right path so ida will find it. And sip sip-4.16.9 that PyQt4 depends on. 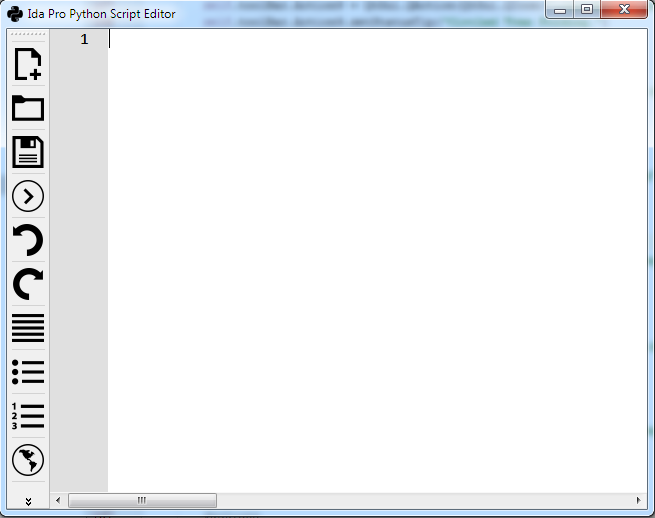 Since many have trouble setting up python correct. It add following regestry changes to path so ida pro will find PyQt. Only added if its not there. Last edited by Storm Shadow; 12-06-2015 at 23:17. I could successfully install the editor and started perfectly now I realize that I have of some problems using it. and then either neither the publisher nor in the command bar can be used without pulling the same mistake. thats a very wierd error. Ida original editor cant even run this command. (exept the command line box)they properly supressed the error from even running. Error thinks the the int is a string. Last edited by Storm Shadow; 12-08-2015 at 19:13.
i fixed error in my editor, and will upload it later to repo. Did code recognition work also after you used the installer ? Last edited by Storm Shadow; 12-08-2015 at 19:56. I can see when you type idaapi and point a menu appear with the attributes. This is the only feature I can see. I speak Spanish and barely can write and understand english sorry. yes then its working, the is code reconition for both ida pro python api , and all the satnadard finctions for python it self. Also there is on off toggle for this. Last edited by Storm Shadow; 12-09-2015 at 02:11. For fix the bug is necessary reinstall your compiled qt with a New version or only updating the editor is enough.